Honest feedback is better than no feedback. The beer is locally but not a good choice. For the main course we had “ the fish “ it was well prepared. The service was not outstanding like in every other restaurant. The location was to loud because of a group in the back room which destroyed the atmosphere. A bit overpriced for my taste. 30 € for a main course of 50 g of cous cous, 8 pieces of legumes and a low temperature cook 100 g of lotte. Un accord mets vins parfait, de belles associations de goût, des surprises gustatives! Menu découverte en 7 plats, excellent, raffiné et divinement bon. Fabulous, inspiring food and great staff! The entrance and decor was under-whelming but the food was so incredible, that those minor things faded into the background. Excellente table ! À recommander sans hésitation ! Our first taste of truly French cuisine. Ordered the 5 course menu, but with some little entrees etc, really turned out to be 8. All small portions spread out over 2 hours, really great.ecellent service as well. The maitre d spoke English which was a great help to us & also I enjoyed his wine selection. 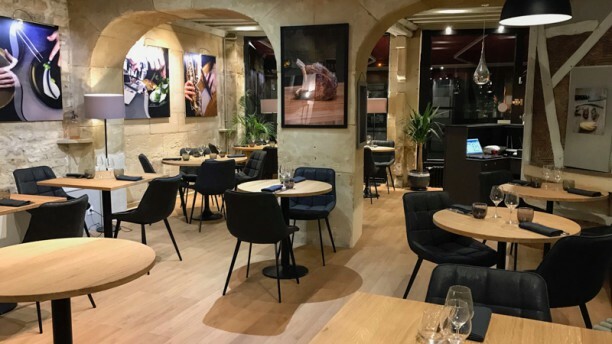 The best food, service and atmosphere we had during our vacation in Normandy. Wine (gin) pairing out of this world. I strongly recommend! ONE OF THE BEST MEALS I'VE HAD IN FRANCE...AND I'VE LIVED & TRAVELED EXTENSIVELY IN THIS COUNTRY. THE LOVELINESS OF THE STAFF EQUALLED TO CUISINE.